Featuring Celtic harp, bagpipes, and English concertina, the distinctive duo Port Righ also incorporates vocals into their passionate renditions of traditional Celtic music. The duo specializes in Scottish music and has spent a great deal of time in Scotland absorbing the sights, sounds, and nuances of the culture, lending authenticity to their unique sound. While ranging from lively marches and dance tunes to wistful airs from Scotland, Port Righ broadens their repertoire with traditional Irish music, vocal pieces, and their own original works. Their musical partnership is marked by a warm, balanced sound and a faithfulness to Celtic tradition. In every performance audiences can clearly see their respect for each other and their passion for the music they create. 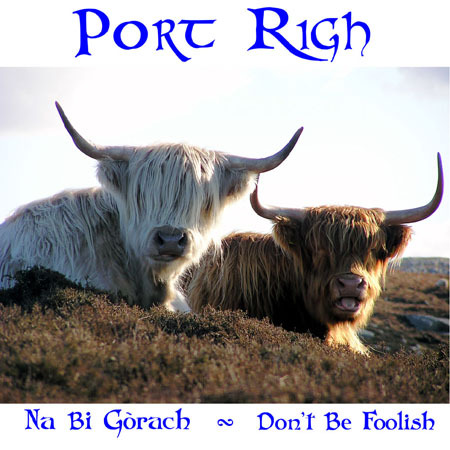 Port Righ's first album Na Bi Gòrach is a collection of mostly Scottish tunes, with a few originals and a sea shantey thrown in for additional spice. Click here for more details. For immediate secure online purchase using your PayPal account. Jo has had a report of a problem ordering through CD Baby and CD Baby is not answering through email. If you try ordering through them, be aware of potential problems. 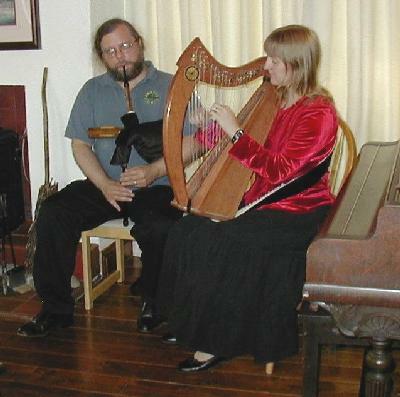 Wayne and Jo Morrison have performed together at An Lanntair (Stornoway, Isle of Lewis), the Potomac Celtic Festival, the American Music and Arts Festival, the Library of Congress, the Anam Cara artists' centre in Ireland, a concert tour in Norway, the Somerset Harp Festival, the Smithsonian, the Maryland Renaissance Faire, Mount Vernon, and other venues throughout the United States. 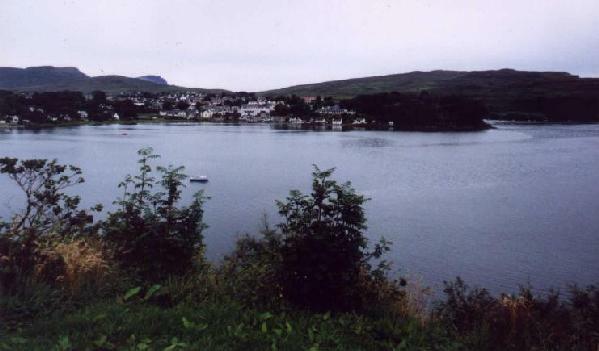 Port Righ (pronounced "port ree"*) is the Gaelic name for the town of Portree on Scotland's Isle of Skye. It is usually translated as "king's port" but may also be translated as "king's music" or "king's song." Since the Celtic harp and the bagpipes were both historically used to entertain kings, the name seems fitting for this unusual group. In addition to playing on Na Bi Gòrach, Wayne features prominently as shuttle piper and vocalist on four of Jo's solo recordings, The Three Musics (1998), A Waulking Tour of Scotland (2000), Christmas Gifts (2003), and Flights of Fantasy (2008). Jo also has an entirely solo album, By Request (2004), that consists of her most-requested music. Jo's Flights of Fantasy is a collection of Jo's original music. Waulking Tour was directly inspired by one of their several trips to the Scotland, during which they explored that country's land, music, history, and culture. This strong commitment to learning about the Celtic world lends authenticity and passion to their music. When not performing, Wayne and Jo share their knowledge and love of the music with others as instructors at Common Ground on the Hill, a traditional music and arts center in Westminster, MD. Port Righ is available for any type of event, including concerts, weddings, funerals, corporate parties, anniversaries, and private functions. For bookings, you may contact Port Righ at info@portrigh.com or 410-875-0855. This page Copyright © 2013 by Wayne Morrison. All Rights Reserved.